October 17, 1927 - May 27, 2012. Studies of mathematics, physics and mathematical logic, University of Münster and ETH Zürich. Ph.D., University of Münster 1950. Scientific Assistant, University of Erlangen 1950-1952. Member, Institute for Advanced Study (Princeton) 1952-1954. Scholarship holder, University of Münster 1954-1955. Habilitation, University of Münster 1955. Assistant Professor, Princeton University 1955-1956. 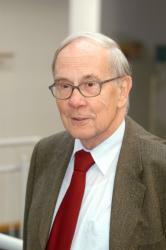 Full Professor of Mathematics, University of Bonn 1956-1993. Founding director, MPI for Mathematics 1980-1995. Honorary doctorates of 15 German and foreign Universities and Academies. Wolf Prize 1988. Lobachevskij Prize of the Academy of Sciences USSR 1990. Stefan Banach Medal of the Polish Academy of Sciences 1999. Alfried Krupp Science Prize 2000. Georg Cantor Medal of the German Mathematical Society 2004.